Was it not Henry Ford who stated "...any colour as long as it is black"? Well now it appears that in London, black is the new red, as the first of twenty New Routemasters (or New Bus for London), in an allover black livery commence operation. The first are to be found on route 38 (Clapton Pond & Victoria Station), the very first route to have the new bus type appear nigh on two years ago. Mark Lyons has supplied three images of LTs 184 and 209 taken on the 25th May in Islington. All are coloured thus, along with text and images for Adidas to promote the football World Cup that is about to commence in South America. It is allegedly said in some quarters, that this sort of allover advertisement is more financially rewarding than the revenue generated from the passengers. Perhaps that is why there is a proliferation of highly colourful buses running around on central London routes. 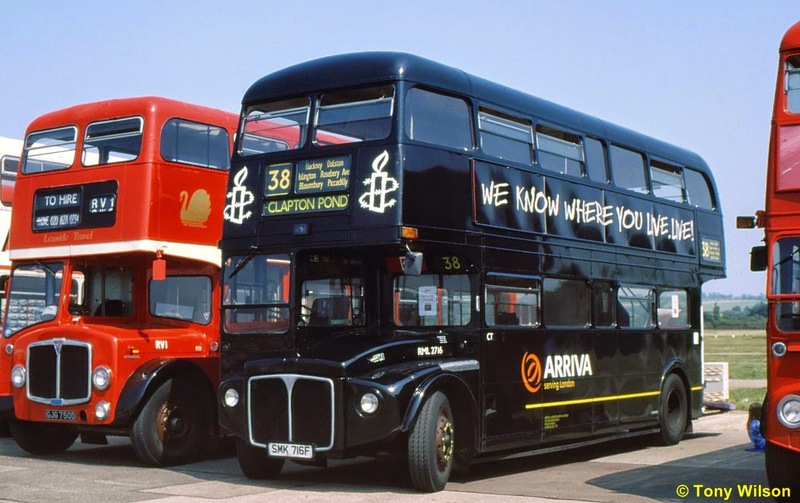 However, this is not the first time that a bus has appeared in a black base livery on route 38, as illustrated below. 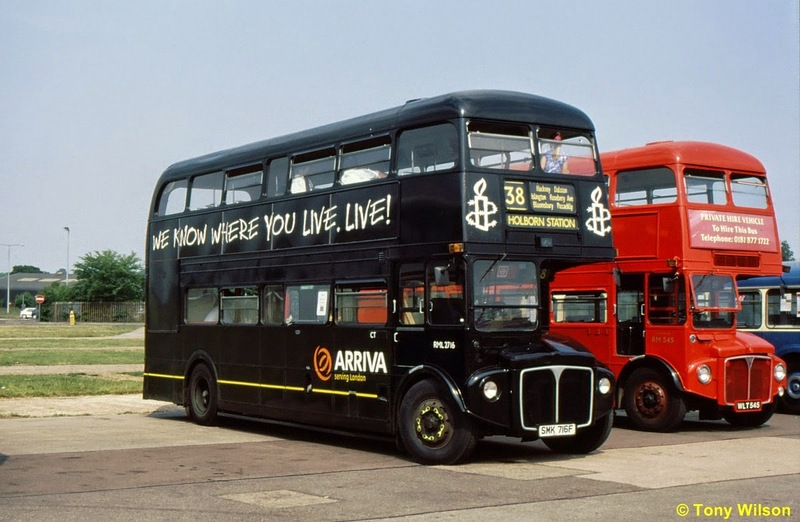 During 2001, long Routemaster RML 2716 sported the colour along with promotional advertising for Amnesty International. 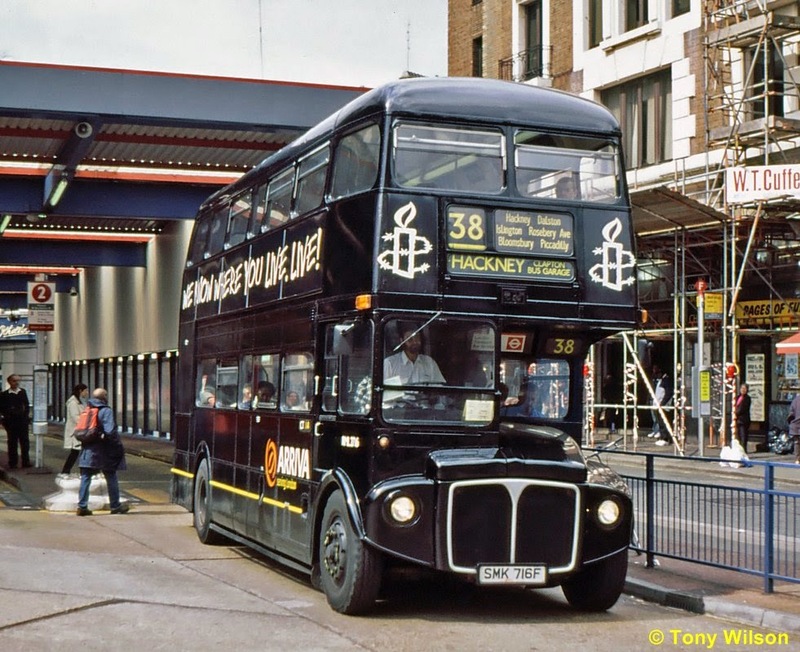 The bus is shown here as it prepares to depart the bus station adjacent to Victoria railway station on the long haul via the West End and the inner North London suburbs to its home garage at Clapton in the London Borough of Hackney. Almost 30-years earlier though, an AEC Merlin makes the identical manouevre at virtually the same spot in Victoria in September 1972. 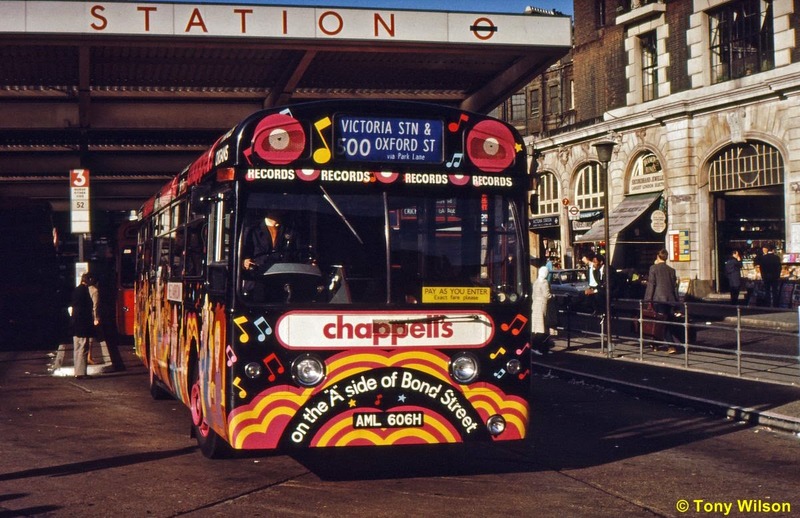 Not quite as black as the others though, the base colour sported a variety of other bright colours in order to promote the Chappells record store in the West End. Indeed the bus would passed by regularly as the Red Arrow route 500 ran along most of Oxford Street wherein the store was located. Later after some alleged complaints that it could not be distinguished from other vehicles, the front of the bus was repainted red. 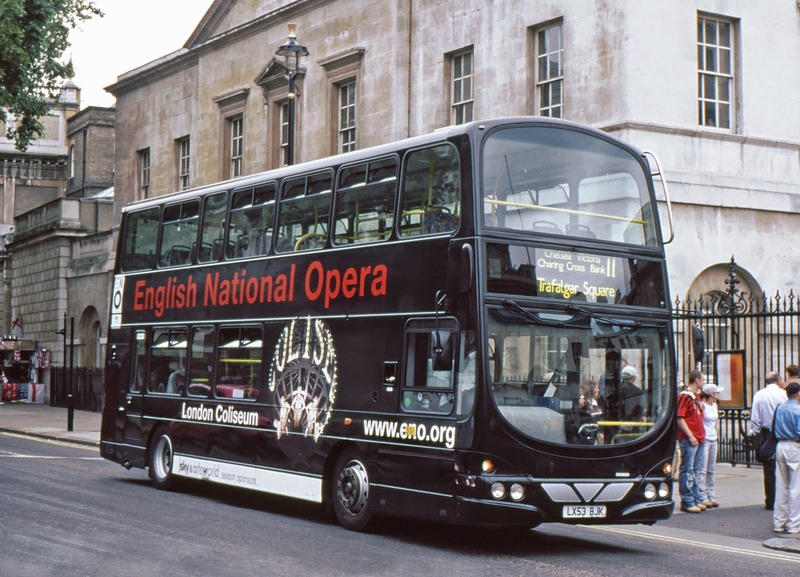 By the 1990s London's bus companies were privatised which allowed a little bit of commercial flexibility. 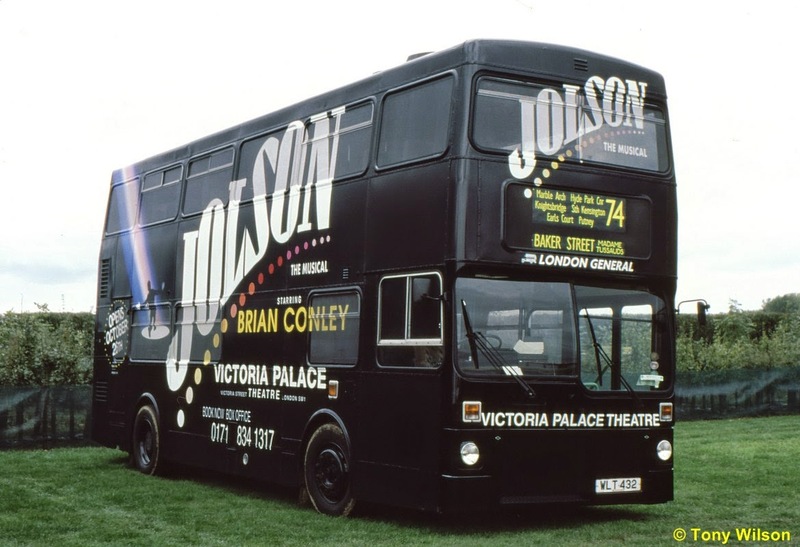 Here one of the MCW Metrobuses in the London General fleet in this livery to promote the 'Jolson' musical at the Victoria Palace. M1432 shows off the result in the green surroundings of the 1995 Showbus event at Duxford. Around the same time one of London United's Alexander bodied Dennis Tridents passes along South Parade in Acton in May 2004. Still with the operatic theme, this one promotes another musical 'The Phantom of the Opera'. But finally we close with another look at the 'real' Routemaster, as opposed to one of the 'new' versions. RML 2716 shows both near and offside aspects in the sunshine at the annual bus rally on the North Weald airfield. Not quite ended though. The black livery is not confined just to London. 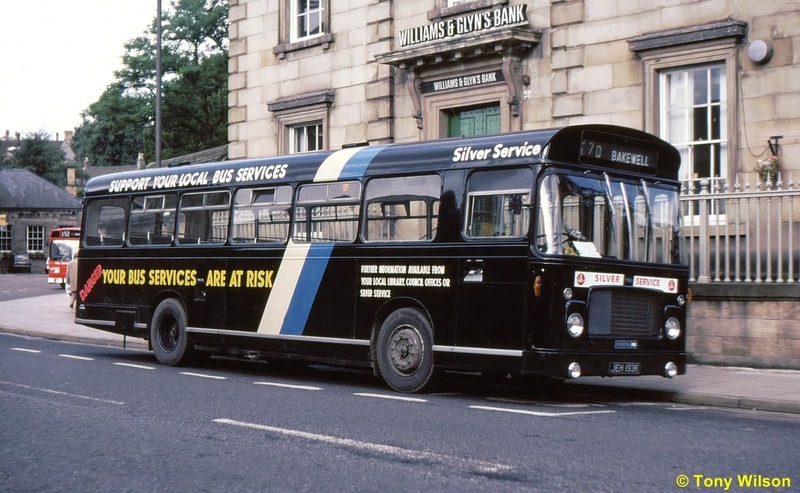 Other operators in the United Kingdom have in the past and even now, run buses and coaches in black based liveries. A few of these such as below, can now be viewed here on the Focus Flickr site. The last of this trio shown here at the Derbyshire town of Bakewell back in August 1985, is somewhat pertinent to the present day. 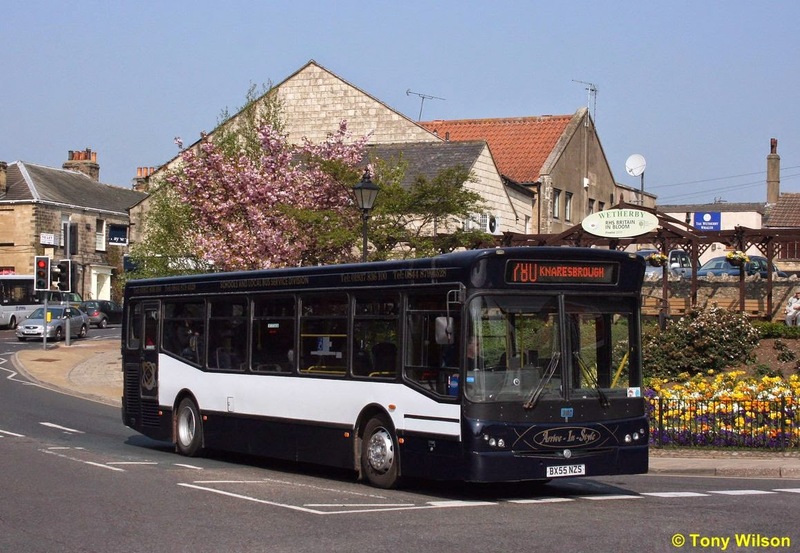 In the light of pressure placed on today's bus operations, especially those in the more rural areas, perhaps another campaign as was in evidence during the mid 1980s may be required.